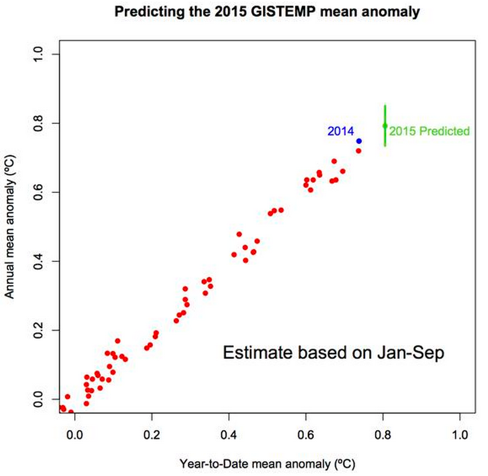 It’s hardly news to predict that 2015 is almost certain to break the global surface temperature record. The data in this graph are the latest NASA GISS monthly temperature anomalies (1951-1980 baseline), shown in solid lines, while the dashed and dotted lines are from the hitherto little-known future temperature series known as ANDY GUESS, updated in July 2015. I’m not attempting any serious forecasting here, just indulging in a what-if exercise. Note that my starting point in July is a little above the actual GISS value, for that month, this is because NASA subsequently tweaked their data a little. I have just selected a few recent hot years for comparison in this graph. Basically, I have assumed that the current El Niño will persist until the end of the year, that its effects on global temperatures will lag by six months or so and that this El Niño will run a little hotter than recent ones. I just wanted to see how these guesses would play out for average global temperatures in 2015 and 2016. The result is shown below. The 2015 average temperature anomaly, according to my guesswork, will be 0.825 deg C, a jump of 0.075 above the previous record set in 2014. Temperature anomalies will have to average 0.58 deg C for the remaining three months of 2015 for 2014 to stay on top and that looks very unlikely to happen, especially with an El Niño still in full force. According to my smudged and cracked crystal ball, 2016 will be a little hotter still at 0.833 degrees C, setting a rare three-year run of records. But that is obviously highly speculative and uncertain. Anything, apart from me being right for my expert insight, could happen. I repeat, this is at best a semi-informed guess. I would welcome correction from people who know what they are talking about. Better still, I will plot up any month-by-month forecasts provided by readers of monthly anomalies for the remainder of 2015 and for next year. So that we can have a contest, just provide 15 numbers (monthly anomaly estimates to one-hundredth of a degree) for October 2015 to December 2016 inclusive and I’ll plot them up. I’ll update the plots regularly as reality unfolds. Let’s have a quick look at a couple of other recent analyses based on the GISS data. This is Sou’s latest graph showing year-to-date averages. Note how the early-year averages are more variable than the averages toward the end of the year. Of course, this is a function of reducing noise by averaging over an increasing number of months. 2015 is streets ahead of the rest and we would need a 1998-style end-of-year collapse for 2015 to end up below 2014. 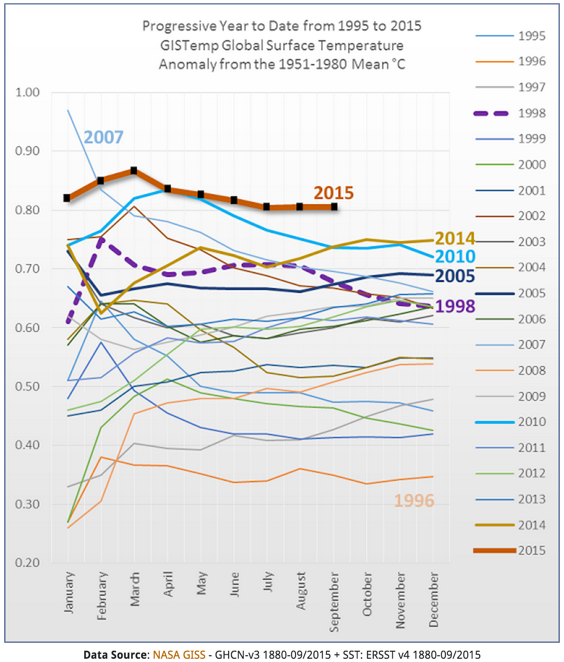 Gavin Schmidt tweeted this graph, which cross-plots the year-to-date mean anomaly against the final annual anomaly. 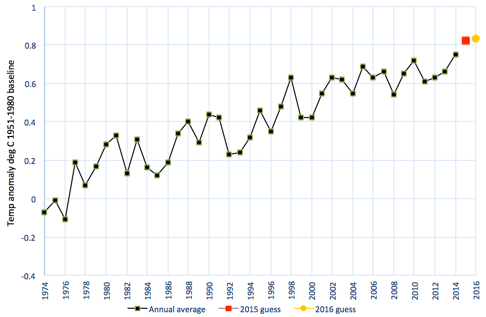 He estimates that there’s a 93% chance of 2015 being the warmest year. That’s fairly consistent with my (eyeballed) comment on Sou’s graph where it would take an exceptional one-in-twenty end-of-year anomaly fall (1998 is the only one among the years 1995-2014 that fits the bill) to put 2015 under 2014. Gavin’s analysis is purely statistical and is not informed by the fact of the current strong El Niño, so his 93% estimate of a record is conservative. His prediction (sans future El Niño effects) for 2015 is (roughly) 0.80 degrees, which is also what you get if you simply extrapolate Sou’s 2015 line based on the last three months’ year-to-date averages. My guess is 0.825 degrees. This entry was posted in Uncategorized and tagged NASA GISS, Surface temperatures. Bookmark the permalink. very nice article. For 2016 though do you think the temperatures could be higher maybe closer to 0.90? because of the lag of this years very strong el nino, very similar to 1997-98, 98 was much warmer than 1997. And the el nino this year peaks intensity which the scientists say around nov-dec time. Thanks, great article. Anything is possible for 2016, but to set a big record for that year will require very warm temperature to be maintained over the latter half. Already, I have “predicted” all time record temperatures for the first seven months. The latest model forecasts I have seen have the El Niño peaking around December 2015, but who knows if that will turn out to be right. See the spaghetti graph in this post.